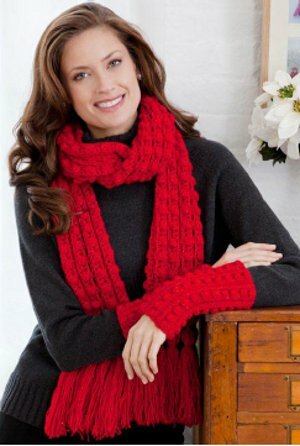 Make a statement this winter with this Shimmering Lacy Bobble Scarf and Wristlets from Red Heart Yarn. If you get started early enough, you can make these unique Christmas gifts for family, friends, and co-workers! Find more festive holiday patterns in Red Heart's special eBook, Jolly Holidays: 15 Free Knit and Crochet Gifts and Holiday Projects. GAUGE: Scarf: 13 sts = 4”; 14 rows = 4” in pattern with 6mm hook. Wristlets: 16 sts = 4”; 14 rows = 4” in pattern with 4mm hook. CHECK YOUR GAUGE. Use any size hook to obtain the gauge given. Cl (cluster) = [Yo and draw up a loop, yo and draw through 2 loops] 3 times all in same stitch indicated, yo and draw through all 4 loops on hook. When pattern indicates to work into the back loop of a stitch, work into the furthest loop of the stitch away from you as it faces you. 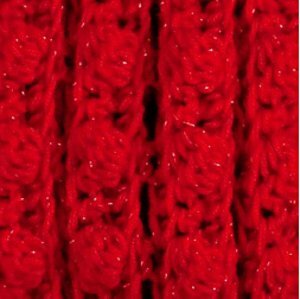 If working the last stitch of a row produces an uneven edge, work the last stitch as you would normally. Row 1 (Right Side): Ch 241; sc in 2nd ch from hook and in each ch across; turn—240 sc. Now work in back loops throughout, unless instructed otherwise. Row 2: Ch 1, sc in first sc, Cl in next sc, * sc in next 2 sc, Cl in next sc; repeat from * to last sc; sc in last sc; turn—80 Cl. Row 3: Ch 1, sc in each st across; turn—240 sc. Row 4: Ch 1, sc in first 2 sc, * ch 2, skip 2 sc, sc in next sc; repeat from * to last sc; sc in last sc; turn. Row 5: Ch 1, sc in first 2 sc, * sc in back loops only of next 2 ch, sc in next sc; repeat from * to last sc; sc in last sc; turn. Repeat Rows 2-5 for pattern 4 times more, and then repeat Rows 2 and 3 once more. Fasten off. Weave in ends. Cut a piece of yarn approximately 6” long to be used to tie tassel at the top. Place at top of cardboard. Wrap yarn lengthwise around cardboard 20 times, keeping 6” piece on top of cardboard. Tie the 6” piece around the wrapped yarn at the top edge of the cardboard to secure. Cut wraps at bottom edge of the cardboard. Wrap another length of yarn around the tassel approximately one-inch down from the first tie. Trim bottom of tassel evenly. Using the original 6” piece at top of tassel, attach 5 tassels evenly spaced across each short edge of scarf. Row 1 (Right Side): Ch 34; sc in 2nd ch from hook and in each ch across; turn—33 sc. Row 2: Ch 1, sc in first sc, Cl in next sc, * sc in next 2 sc, Cl in next sc; repeat from * to last sc; sc in last sc; turn—11 Cl. Rows 3-5: Ch 1, sc in each st across; turn—33 sc. Repeat Rows 2-5 for pattern 5 times more, and then repeat Rows 2-4 once more. Fasten off, leaving a 15” strand. With yarn needle and strand, sew top of last row to beginning ch, matching stitch for stitch. Weave in ends. Red Heart has discontinued their Shimmer yarn! And it makes me very, very sad. I used to make cowl neck scarves with that yarn all the time. I sold my work. I always got lots of compliments on them when I would wear them, and that is how I got interested parties to place orders with me. This scarf and arm warmer set is so festive for the holiday season! I wonder what kind of yarn would be a good replacement for it? I know Vanna's Choice makes on called a Glamour yarn. Very easy and pretty. Made the scarf only in one weekend.